As we’ve covered previously, the 83 Tigers and 84 Kangaroos had the worst seasons of all the reigning minor premiers in AFL/VFL history since 1898. After 11 games of the season, each of those sides had won two and lost nine. 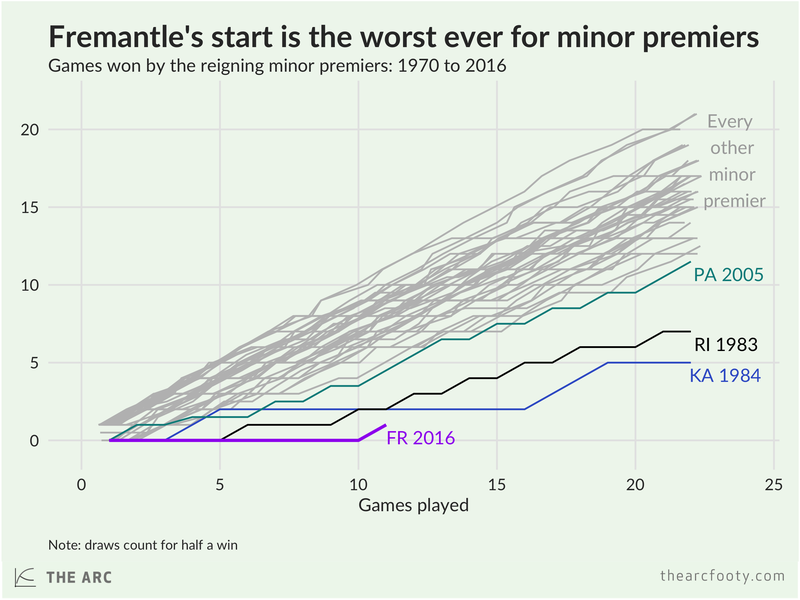 After winning their Round 11 match-up against the topped-up Bombers, the Dockers sit at one win and ten losses, the new worst start to the year for last year’s minor champs. Of course, the Dockers have conspicuously flicked the switch to “rebuilding,” so they’re not necessarily playing to win. Nevertheless, the unprecedented epic suckitude of their record this season is still notable.